Recognizing the need for greater cooperation in understanding and predicting weather and climate, the U.K. Met Office and NCAR recently signed an agreement to conduct joint research. While many scientists from the two organizations already work together individually, the new arrangement encourages the merging of observing and field programs and facilitates the sharing of insights related to modeling, software engineering, and instrument creation. Specific research that the agreement promotes includes fundamental atmospheric processes, particularly related to the planetary boundary layer; upper-ocean processes and short-term upper ocean-atmosphere interactions in weather and climate prediction; next-generation modeling for massively parallel computing architectures; predictability of the climate system on seasonal-to-decadal timescales; and real-time attribution of hazardous weather and climate extremes to human influences. 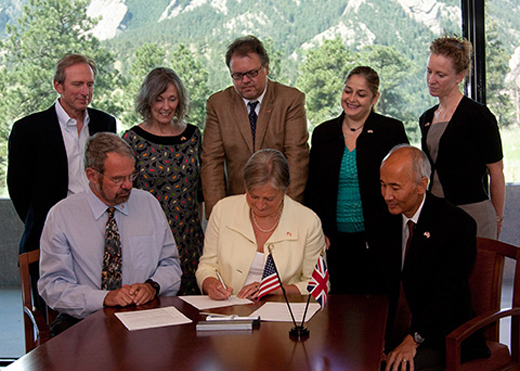 Representatives of NCAR and the U.K. Met Office sign the partnership agreement at NCAR's Mesa Laboratory. 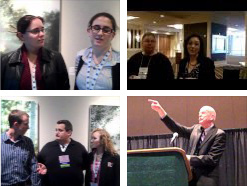 From left to right, standing: NCAR's William Skamarock, Maura Hagan, and Peter Backlund, May Akrawi of the Office of the British Consulate-General, and NCAR's Rachel Hauser; seated: UCAR's Richard Anthes, Julia Slingo of the U.K. Met Office, and NCAR's Roger Wakimoto.